A debut album that dazzles with imagination, heart, and a style that's genuinely unique. Casey Dienel has been writing songs since she was a little kid, growing up in a New England fishing village. But she never recorded them. Now she's in her early 20s and is releasing her first recording, which means she's had plenty of time to perfect her songs, to tinker around until she found her own unique style of songwriting. Or at least that's how it seems, considering how unique her music is, and how well her debut album Wind-Up Canary sounds like the work of someone who has found a way to mold a variety of influences and inclinations into music she can truly call her own. The first sound on Wind-Up Canary is that of Dienel's piano, which she plays in a rolling, slightly rambunctious, yet always sophisticated way, like she's putting on a musical and providing all the music herself, or as if she were a riverboat piano player who picked up bits of the local music from the ports she passed through along the way. "When I was only four I found my lonely ivories / and we became fast friends," she sings on "Everything"…and if that's not an autobiographical line, it might as well be, considering how skillfully her hands move across the keys, gently stirring up melodies here, powerfully hammering out emphasis there. Her piano is joined by a banjo, an upright bass, some horns, a cello, guitar, and percussion… and of course her voice, which is in and of itself quite distinct. She sings upward and outward like a jazz singer, her voice trembling and glimmering and inducing shivers. At the same time she sings straight ahead, telling a story in song. Somehow her voice is grounded and flighty at the same time, soaring but without drama or spectacle. She's a cabaret singer, she's a humble indie-label musician playing house parties and coffee shops, she's a torch singer belting her heart out, she's an author turning her fantasy worlds into songs. She's all of this and more, at once. On Wind-Up Canary Dienel and friends create music that feels like it's of another era, but not a particular one. An imagined one, maybe, where life's a grand fairy tale, not without pain but always with a certain panache and mystery to it. Or is that the story of today? It seems to be through Dienel's eyes, as the lyrics never read as anachronistic, more like today's world filtered through her unconventional perspective. In Dienel's hand a song with the basic message "I wish you were here" starts as a remembrance of her love for embroidering and continues into a tale of times spent in the French Alps, drinking strawberry wine, before leading up to the sentiment behind it all. Her "Frankie and Johnny"-type tale of outlaws in love, "Frankie and Annette", starts at a Boston Red Sox game and includes both a Cracker Jack ring and the phrase "Book em, Danno." Dienel has a way of taking small stories and writing them into epics fueled by imagination. She sings of cabins in Vermont, of Folgers tins, of JoAnn Fabrics stores, of a ghostly doctor who fancies himself a ladies man and approaches random women with the line, "voulez-vous couches avec moi?" Her songs impress with the rapid-fire imagination of children's books, yet ultimately what stays with you are the emotions and insights at their core, propelled by her voice. On "Stationary" Dienel cleverly sings about attempts to write about anything but a rejected love, but it's the chorus which she sings with such intent and genuine befuddledness that it leaps out from the speakers: "I can't shake you off baby / no matter how hard I try." "Frankie and Annette" offers a dazzling array of allusions in its tale, but it's the conclusion that life is "all about walking away from the wreck," about pulling a life together from pieces of wreckage, that makes the strongest impression. 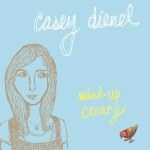 Casey Dienel's debut album should get widely recognized for how fresh and how unlike everything else the music is. Her seamless blend of styles and genres into one that she alone occupies should get her a lot of attention...and for good reason. Her music is endlessly spellbinding. Yet I can't help but also keep thinking of the smaller moments that linger long after the album's over, those places where she acutely gives voice to emotional realizations and dilemmas. Moments like during "Everything", when she encapsulates the feeling of wanting to do everything in life all at once, by excitedly, loudly singing "Do I stay / do I go / I don't know." Or at the album's end, on "The La La Song", when over her piano she slowly sings "it's funny / I like me best with a broken heart." And then she chooses to resolve her quandary by singing "la la la la la la" over and over again, turning to her voice and a tune to express the inexpressible. That's music's power, and Wind-Up Canary's power ultimately lies with her voice, her piano-playing, her melodies, and her words: the way they all stick with you and comfort you. Or as she sings earlier in the album, "if your heart starts feeling slow / there's a refrain I know / and I'll teach you."